Can’t believe I’ve visited Bangkok twice in a span of two months! So nice to rediscover the sights, sounds and tastes of this city. I don’t have much affection for their road conditions and traffic, which is so much like Manila, but I certainly want to explore more of the food and the shopping! Hotel rooms in Vietnam and Cambodia are still cheaper but the ones in Bangkok can also compete with the price and generosity of space. Last July, my daughters and I spent two nights in the city prior to our vacation at the Royal Cliff Beach Hotel in Pattaya. I booked a room at the Banyan Tree Bangkok since I’ve never tried this hotel brand. My curiosity paid off because the hotel spelled five star luxury all over. It all began when we entered the lobby. Wood elements ruled and exuded an air of sophistication. There was a well-stocked mini bar with a coffee/tea maker. Apparently, we can partake of the non-alcoholic drinks in the bar…aside from the complimentary bottled water. The centerpiece was this heavenly-looking bed which faced a TV, hidden from view (that makes it two TVs, if you count the one in the living room.) By this time, I was truly feeling we got a suite but it seems their one-bedroom suites are even bigger, with a kitchenette and even a spa treatment room. Lucia was quick to inspect the marble bathroom which had this huge tub and a separate partition for the rain shower. The bathroom amenities weren’t branded but smelled great! Not seen here is the aromatherapy burner paired with fragrant essential oils. My kids also had a blast swimming in the outdoor pool on the 21st floor. Luckily, it was a beautiful, sunny day. I checked out the gym which had this state-of-the-art equipment and a helpful trainer. This adjoined the pool area. Before the night set in, I had the chance to take photos of Banyan Tree’s Vertigo restaurant and Moon Bar on the 61st floor. The views were breathtaking and afforded one an enviable panorama of Bangkok. We were surprised with the turndown service. My five-year old giggled in delight at the turtle plush toy that came with the free cookies. The breakfast buffet at the all-day restaurant Romsai on the ground floor was excellent. Though I really felt that guests had no choice but to eat in the hotel since there weren’t many restaurant choices when you ventured out into the street. 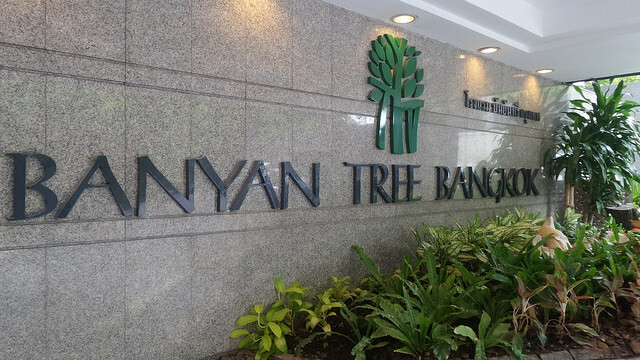 Banyan Tree’s location in the city’s so-called embassy and art gallery row meant that it was far from the shopping and eating district. Silom was livelier and nearer but still a considerable walk from the hotel. I lamented the fact that I wasn’t able to do any shopping but Banyan Tree was a topnotch choice for our little staycation in Bangkok. It certainly was worth every penny.